Cast stainless steel. Four holes for #10 screws. Pack: 2Size: 1-1/2" L x 1-1/2" WFastener: #10.. Cast stainless steel. Four holes for #10 screws. Pack: 2Size: 2" L x 2" WFastener: #10.. Stainless steel. 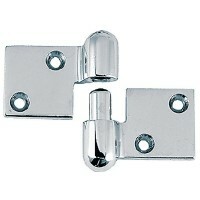 Card: 2Size: 1-1/2" x 4"Fastener: 10.. 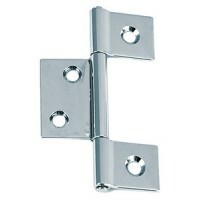 Unique double stud design allows for a flush installation while providing a full 180° swing. This ma.. 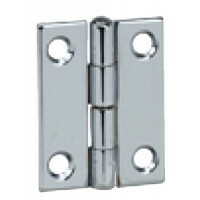 Stainless steel with removable pin so that hatches can be completely removed without removing hinges.. Stainless steel. Card: 2Size: 6" L x 1-1/16" W.. Durable cast stainless steel. Six holes. 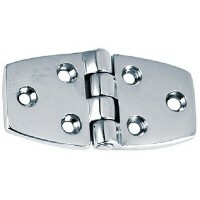 Card: 2Size: 3" x 1-1/2"Fastener: #10.. Stainless steel. Features a PTFE washer between knuckles. 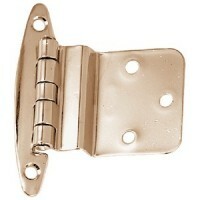 Size: 6" x 4"Fastener: #8..
Chrome plated stamped brass. Semi concealed, for overlay doors. Card: 2Size: 2-3/4" x 12-1/8"..
Removable pins. Screw size is #6. Plated stamped brass. Pack: 2Pin: 1-1/2"Width: 1-1/2"..
Removable pins. Screw size is #6. Plated stamped brass. 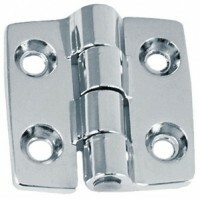 Pack: 2Pin: 2"Width: 2"..
Chrome plated bronze. 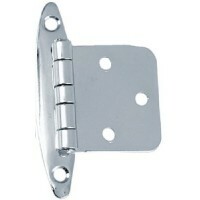 Card: 2Size: 8" L x 3-7/8" WFastener: 12Mtg Holes: 8T Side: 2"..
Semi-concealed for inset doors. Stamped brass. 3/8" inset. #4 screw size. 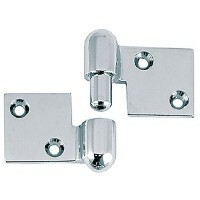 Card: 2Size: 2-3/4" x 2-1/..
Chrome plated zinc. Offset 3/8".#8 fastener size. Card: 2Size: 1-1/2" x 1-1/2"..
2-1/4x1-1/2 short side hinges Card: 2Size: 2-1/4" x 1-1/2"Fastener: #8Short Side: 3/4"Material: Chro.. 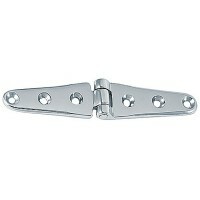 Hinge chrome 2-1/4in 1pr/c Card: 2Size: 2-1/2" x 1-1/2"Fastener: #8Short Side: 3/4"Material: Chrom.. Stamped 304 stainless steel. Fastener #6 FH. 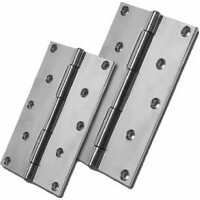 Card: 2A: 2-3/16"B: 2-3/4"C: 1/16"D: 1-1/2"E: 1/2"..
Hinge- 4in strap hinge Card: 2A: 4-1/8"B: 2-1/16"C: 2-1/16"D: 1"E: 3/16"..
Hinge- 6in strap hinge Card: 2A: 5-7/8"B: 2-15/16"C: 2-15/16"D: 1-1/8"E: 3/16"..
Investment cast 316 stainless steel. Pack: 2A: 2"B: 1"C: 1"D: 2"E: 3/16"..
#8FH Fastener. Injection molded fiberglass nylon with a stainless steel pin. Black. Pack: 2Size: 1-1..
Takes #10 FH fastener. Carded. 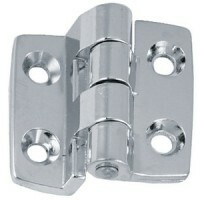 A: 2-1/2"B: 1-1/4"C: 3"D: 1/4"Material: Chrome Plated Brass.. Cast brass. Chrome finish. Pack: 2A: 1-5/8"B: 13/16"C: 13/16"D: 1-5/8"E: 1/16".. Cast brass. Chrome finish. Pack: 2A: 1-5/8"B: 13/16"C: 13/16"D: 2"E: 1/16".. Cast brass. Chrome finish. Pack: 2A: 2"B: 1"C: 1"D: 2"E: 1/16".. Cast brass. Chrome finish. Pack: 2A: 2-1/2"B: 1-1/4"C: 1-1/4"D: 2-1/2"E: 1/16".. Sand cast brass chrome plated. A: 3-7/8"Fastener: #8 FHB: 1-15/16"C: 1-15/16"D: 1-1/16"E: 3/16".. Forged brass chrome plated. #10 fastener. A: 3-7/8"B: 1-15/16"C: 1-15/16"D: 2"E: 3/16"Side: Right..
Carded. #8 FH Fastener. Card: 2A: 2-7/8"B: 1-7/16"C: 1-7/16"D: 1-1/2"E: 3/16".. Stamped 304 stainless steel. #8 fastener. Card: 2A: 2-1/8"B: 11/16"C: 1-7/16"D: 1-1/2"E: 1/16".. Stamped 304 stainless steel. #8 FH fastener. Carded. Card: 2A: 2-3/4"B: 1-3/8"C: 1-3/8"D: 1-1/2"E: 1.. Stamped 304 stainless steel. #8 FH fastener. Carded. Card: 2A: 3-15/16"B: 1-1/2"C: 1-7/8"D: 1-1/2"E:.. Stamped 304 stainless steel. Fastener is #10 FH. Card: 2A: 6"B: 1-1/2"C: 4-1/2"D: 2-1/4"E: 1/16".. Stainless steel. #10 FH fastener. Carded. Card: 2A: 3-15/16"B: 1-1/2"C: 1-1/2"D: 1-1/2"E: 3/16'.. Stamped 304 stainless steel. Fastener #6 FH. Card: 2A: 1-7/8"B: 2-3/4"C: 1/16"D: 1-1/2".. Stamped 304 stainless steel. 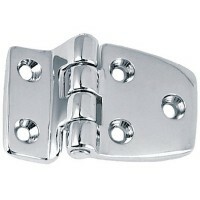 Card: 2A: 7-1/8"Fastener: #8 FHB: 3-9/16"C: 3-9/16"D: 1-5/8".. 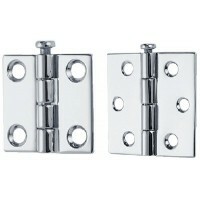 Forged brass chrome plated. #10 fastener. 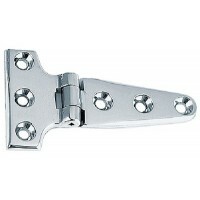 A: 3-7/8"B: 1-15/16"C: 1-15/16"D: 2"E: 3/16"Side: Left..
Investment cast 316 stainless steel. #10 fastener. A: 3-1/2"B: 1-3/4"C: 1-3/4"D: 2"E: 3/16"Side: Rig..
Injection molded fiberglass nylon with a stainless steel pin. Fastener is #8 FH. Carded. Card: 2Size.. Stamped 304 stainless steel. #8 FH Fastener. Pack: 2A: 1-3/8"B: 11/16"C: 11/16"D: 1-1/2"E: 1/16"..